Unfortunately the Tips & Tricks for speaker development page was already very large when I decided to translate my home page into English, so until now it's only available in German. Meanwhile it has grown to more than 20 printed pages and I can't imagine to find the time for a complete translation. You are interested to reproduce music with highest possible fidelity. This manly includes sound balance (linear frequency response) and spatial reproduction (left/right and front/rear). You have a listening room of about 15 to 25 m² and like to enjoy your music with realistic loudness from time to time. You don't hear primarily organ music of mega bass test CDs but normal music, that in general does not include very much excitation below 32 Hz (about 20 dB less = 1/10 than at 50 Hz). Your loudspeakers distance from your hearing place is about 2.5 to 3m (important: identical for both loudspeakers) and your hearing place and your loudspeakers form about an isosceles triangle. The lower the frequency the more confident you can trust predictions or measurements of effects -> for mid and high frequency you should trust your ears more. If it sounds bad it may not be caused by your loudspeakers or your equipment: unfortunately you often find music that is recorded badly (see Limitations of music recordings). This is why we start with the bass loudspeaker and enclosure type selection process. In the low frequency range a linear frequency response of the loudspeaker in the box alone is not most important but the combination of box and listening room, as below 200 Hz the influence of the listening room may be up to +/- 6 dB at some frequencies (see Room acoustics). In most cases the possible loudspeaker locations are limited and the choice of hearing position is restricted by the desired room usage and the furniture. If the loudspeakers are designed for a special operating location it is sense full to evaluate the existing room influences in advance with similar loudspeakers (e.g. subjective evaluation with an adjustable sine wave generator or objective evaluation with a simple measuring program) and to chose a enclosure type (e.g. closed box, transmission line, bass reflex, band pass, horn etc.) that is able to produce the reverse frequency response as good as possible. If a loudspeaker is designed for general placing a bass reflex enclosure should be chosen as the frequency response can easily be modified by +/- 3 dB by simply re-tuning (or even closing) the Helmholtz resonator thus allowing a rough adoption to the room acoustics. However, the tuning frequency should not be higher than 45 Hz as this will cause high excursions of the bass speaker below 70% of the tuning frequency. Even for bass intensive program one 25cm bass or 2 pieces of 17cm bass speakers per box are sufficient for realistic loudness impression (25m²). For smaller rooms (15m²) even one 20cm bass or 2 pieces of 13cm bass speakers per box are sufficient. Bigger bass speakers are appropriate for big rooms, party loudspeakers, mega bass freaks of people with free standing houses!! The number of ways doesn't say ANYTHING about the sound reproduction quality of a loudspeaker system! You should rather build a 2 way system with good loudspeakers and network components than a 3 way system of the same price (-> cheaper speakers and network components)! Only for very high loudness a 3 or more way system is essential! The more ways the more difficult it is to ensure a good spatial reproduction of music (this is where small full range speaker have their strengths!). An ideal compromise are so called 2.5 way systems: this are basically 2 way systems often with a good 17cm bass-midrange loudspeaker who is supported by a second (possibly cheaper) 17cm bass for frequencies lower than approximately 400 Hz. The cross-over frequency should be located between 2000 and 2500 Hz (e.g. DoppelWhopper). the bass loudspeaker reproduces the rough parts, the tweeter the detail. And the midrange speaker reproduces the main aspects of the music! Those who don't believe that: listen to music played via a 3 way system with cone midrange by connecting only the bass, only the midrange and only the tweeter to the frequency dividing network and you will know what I mean!! have a good transient behavior. All this can only be achieve with good cone midrange speakers from 7 to 13cm diameter, which also fulfill criteria 3. Even 75mm dome midrange speakers do not fulfill criteria 1 and are thus not recommended for 3 way systems. However, for 4 way systems especially 50mm dome midrange speakers are first choice for the frequency range from 1000 to 5000 Hz. Especially in 2 way systems you should not try to save money here. A dome tweeter of at least 25mm diameter is required to ensure sufficient dynamic capabilities due to the required low cross-over frequency. In general tweeters without ferrofluid are recommended (e.g.SEAS NoFerro900 or PEERLESS WA10). 19mm dome tweeters or "normal" ribbon tweeters are reserved for 3 way systems as they should not be operated below 4 kHz (this would cause excessive harmonic distortions at high reproduction levels). If you have ever experienced how much you can fine tune a FDN to your speakers you will never buy a standard FDN or slavishly rebuild a FDN of a distributed project. The next higher or lower value of a FDN component often has a small but positive influence to the total sound. You can use this e.g. to fine tune your system to your listening room (high/low absorption) and the rest of your reproduction chain. My tip: use pink noise for fine tuning of the FDN as the sound balance is defined and does not change over time! However, the final version of the FDN should be defined by extensive listing session to different recordings of high quality (see some proposals here)! A linear frequency response on axis alone should not be the main criteria. Even 15° to the left, right, top or bottom the frequency response curve may change only slightly. Otherwise you may not expect a stable spatial reproduction. To fulfill this criteria a total slope (speaker + FDN) of at least 18 dB/octave is required. High pass filters (so called, because they let only high frequencies pass) should have an electrical slope (FDN alone) of at least 12 dB/octave. Otherwise the maximum excursion (which limits the maximum achievable SPL without exceeding a certain distortion level) occurs outside its operating range (which is definitely unwanted!). Don't worry about different electrical slopes of the FDN: only the combined frequency response (speaker + FDN) is essential! However, the slope of both speakers should be symmetrical relative to the cross-over frequency. Nevertheless the FDN should be designed in a way that a homogeneous frequency response is achieved when all speakers are connected in phase! This is the only way to guarantee a correct behavior in the time domain and therefore a stable spatial reproduction (otherwise a step function will cause the bass to go forward and the tweeter to move back!). There are 2 principal strategies: stiff or damped. For a sub woofer or a 3 way system with a cross-over frequency to midrange of less than 500 Hz the behavior may be stiffened by (possible several complementary) ring shaped braces (massive plates with at least 50% opening share and about half material thickness). This ensures that the plate resonances are shifted clearly above the operating range of the bass speaker and therefore are barely excited. All 3 layers must be glued/welded together on the whole contact area so that the unavoidable resonance of the plates can be damped out effectively. Ring braces between the outer panels are not desired here as they would cancel out the damping effect! For sub woofers only on the panel opposite to the loudspeaker side acoustic foam should be applied (glued or clamped). finally the remaining space should be filled with glass or mineral wool which is even less porous. Remember: Absorption = Conversion of velocity to heat by means of friction! Therefore the absorption properties of a material are determined by its flow resistance! It can be estimated by just breezing through! By this strategy the sound should be not reflected but forced to enter the material in order to be absorbed. This can be improved by providing some kind of sound routing to direct the sound away from the speaker into an acoustic dead end. All panels should be applied with acoustic foam or with carpet (100% wool) for slim enclosures (use glue). The remaining space should be filled to 50% with polyester wadding. Again some kind of sound routing is recommended that prevents a direct optical connection between speaker and resonator (especially important for 2 way systems). Particularly for 2 way systems the routing should end in an acoustic dead end that should be filled with sheep wool (see example to the right). See below my proven way to develop good speaker systems. And now I wish you good luck for your speaker project! Select loudspeakers with minor frequency and transient response errors, especially those with a quick and smooth cumulative decay spectrum (see e.g. speaker magazines etc.). For good spatial reproduction use as identical speakers as possible, e.g. with following serial numbers. Calculate the required behavior volume e.g. with AudioCad or Lasip. Build a test behavior (one channel only). 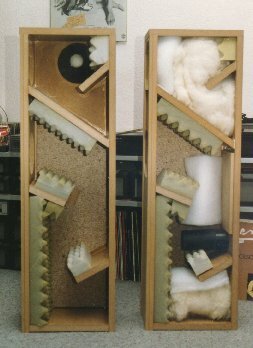 Build separate enclosures for the bass, mid and high frequency speaker so that different arrangements and vertical displacements can be tried out. One side of the test behavior should be made removable so that the influence of internal routing and absorption can be checked out easily. Depending on the room acoustics and the loudspeaker placement the low frequency enclosure type (e.g. closed box or bass reflex, box volume and tuning frequency etc.) must be reworked. Therefore the transfer function between desired speaker and listening position must be measured. Measure frequency response and impedance of each speaker (using e.g. SB_OCT) and use this as an input for the behavior absorption and FDN optimization. Import measured data into a simulation program (e.g. AudioCad ECNC 8.0). Based on the measurements make a rough estimation of the most promising cross-over frequencies and the required FDN filter slopes. Then make a quick simulation of the FDN e.g. with AudioCad ECNC 8.0 (first each speaker alone, then in combination). If required buy some FDN components (one system only) and build a quick and dirty external FDN and measure all speakers with FDN (0° and 15° left/right and top/bottom, speakers alone and in combination!). New iteration of last two steps (if required). As soon as the overall response measurements are looking good the system is evaluated subjectively using several recordings of high quality (see Limitations of music recordings). The external FDN is modified slightly (e.g. by increasing/decreasing single component values by one step) in order to minimize subjectively or objectively detected errors. In the cross-over region the localization trick is used (see below). Intensive iteration of the last two steps. This should be done in various sessions on several days because these kind of iterations are very tiring and you may soon come to a point where you are no longer able to do the right decisions. For safeguard reasons finally the impedance of the total system should be measured (look for critical minima)! Build the final behavior with the findings of the optimized loudspeaker arrangement, internal absorption, sound routing, possible protection measures etc. Perform an objective and subjective evaluation with the optimized FDN when using the provisional test behavior. Perform further iterations of required. Build the final FDN with high quality components (e.g. MKP capacitors for tweeter and midrange if they are in series with the loudspeaker etc.). Even für the internal wiring from/to the FDN a high quality cable should be used (e.g. B&W CDC 8 or 6 (tweeter only)). A basic problem of music is that it varies very much with time and is very fugitive. It is very difficult to catch all details at once. This is much easier using noise signals as here the amplitude spectrum is more or less constant over time. I prefer to use pink noise for subjective evaluation because its spectral composition is very comparable to real music. The goal is to make the noise signal sound very homogeneous and smooth without being able to detect a single speaker out of the system. Especially narrow band peaks (which may deteriorate the listening impression very much) can be easily detected this way. Pink noise is also well suited for the evaluation of the sound distribution, especially in the region of the cross-over frequency. Starting from the symmetry axis between both concerned speakers you should move slightly to the left and right or bottom and top and listen to tonal changes of the noise. These changes should be very small in order to enable a stable spatial reproduction over a wider listening area. An optimum overlap between e.g. a woofer and a tweeter is characterized by the impression that the noise signal seems to come neither from the woofer nor from the tweeter but from a virtual point in between both speakers. In order to evaluate this virtual radiation point I use a simple trick: I try to make me believe that all noise comes e.g. only from the woofer alone (one of many possible assumption). If the assumption is obviously not true it is very heard to make your brain believe that because there is in internal resistance to accept the assumption. The easier it is to accept the assumption the more true the assumption is. In this way I am able to limit the area of virtual radiation!